Tag words: bacteriology, bacteria, microbiology, microbe, metabolism, energy generation, autotroph, heterotroph, lithotroph, phototroph, chemoautotroph, lithoautotroph, photoheterotroph, archaea, carboxydobacteria, nitrifying bacteria, iron bacteria, thermophile, hyperthermophile, anabolism, catabolism, nicotinamide adenine dinuclotide, NAD, NADH, adenosine triphosphate, ATP, proton motive force, pmf, electron transport system, fermentation, alcohol fermentation, lactic acid fermentation, mixed acid fermentation, butanediol fermentation, butanol fermentation, pyruvate, acetyl CoA, respiration, aerobic respiration, anaerobic respiration, denitrification, sulfate reduction, methanogenesis, photosynthesis, oxygenic, anoxygenic photosynthesis, bacterial photosynthesis, light reactions, dark reactions, CO2 fixation, RUBP carboxylase, ribulose bisphosphate carboxylase, RUBP, Calvin cycle, glycolysis, Embden Meyerhof pathway, Entner Doudoroff pathway, phosphoketolase pathway, homolactic, heterolactic, KDPG aldolase, tricarboxylic acid cycle, TCA, reverse TCA, citric acid cycle, Kreb's cycle, CODH pathway, ATP synthesis, substrate level phosphorylation, electron transport phosphorylation, oxidative phosphorylation, photophosphorylation, cytochrome system, chlorophyll a, bacterial chlorophyll, carotenoid, ferredoxin, biosynthesis. Lithotrophy is the use of an inorganic compound as a source of energy. Most lithotrophic bacteria are aerobic respirers that produce energy in the same manner as all aerobic respiring organisms: they remove electrons from a substrate and put them through an electron transport system that will produce ATP by electron transport phosphorylation. Lithotrophs just happen to get those electrons from an inorganic, rather than an organic compound. Some lithotrophs are facultative lithotrophs, meaning they are able to use organic compounds, as well, as sources of energy. Other lithotrophs do not use organic compounds as sources of energy; in fact, they won't transport organic compounds. CO2 is the sole source of carbon for the methanogens and the nitrifying bacteria and a few other species scattered about in other groups. These lithoautotrophs are often referred to as "chemoautotrophs", but the term lithoautotroph is a more accurate description of their metabolism. The lithotrophs are a very diverse group of procaryotes, united only by their ability to oxidize an inorganic compound as an energy source. Lithotrophy runs through the Bacteria and the Archaea. If one considers methanogen oxidation of H2 a form of lithotrophy, then probably most of the Archaea are lithotrophs. Lithotrophs are usually organized into "physiological groups" based on their inorganic substrate for energy production and growth (see Table 5 below). * The overall process of nitrification, conversion of NH3 to NO3, requires a consortium of microorganisms. The hydrogen bacteria oxidize H2 (hydrogen gas) as an energy source. The hydrogen bacteria are facultative lithotrophs as evidenced by the pseudomonads that fortuitously possess a hydrogenase enzyme that will oxidize H2 and put the electrons into their respiratory ETS. They will use H2 if they find it in their environment even though they are typically heterotrophic. Indeed, most hydrogen bacteria are nutritionally-versatile in their ability to use a wide range of carbon and energy sources. Some hydrogen bacteria possess an NAD-linked hydrogenase that transfers electrons from H2 to NAD in a one-step process. NAD then delivers the electrons to the ETS. Others have hydrogenase enzymes that pass electrons to different carriers in the bacterial electron transport system. The methanogens used to be considered a major group of hydrogen bacteria - until it was discovered that they are Archaea. The methanogens are able to oxidize H2 as a sole source of energy while transferring the electrons from H2 to CO2 in its reduction to methane. Apparently, H2 has more energy available than CH4, for all you physical chemists out there. Metabolism of the methanogens is absolutely unique, yet methanogens represent the most prevalent and diverse group of Archaea. Methanogens use H2 and CO2 to produce cell material and methane. They have unique coenzymes and electron transport processes. Their type of energy generating metabolism is never seen in the Bacteria, and their mechanism of autotrophic CO2 fixation is very rare, except in methanogens. The carboxydobacteria are able to oxidize CO (carbon monoxide) to CO2, using an enzyme CODH (carbon monoxide dehydrogenase). The carboxydobacteria are not obligate CO users, i.e., some are also hydrogen bacteria, and some are phototrophic bacteria. Interestingly, the enzyme CODH used by the carboxydobacteria to oxidize CO to CO2, is used by the methanogens for the reverse reaction - the reduction of CO2 to CO - during CO2 fixation by the CODH pathway (Figure 23). The nitrifying bacteria are represented by two genera, Nitrosomonas and Nitrobacter. Together these bacteria can accomplish the oxidation of NH3 to NO3, known as the process of nitrification. No single organism can carry out the whole oxidative process. 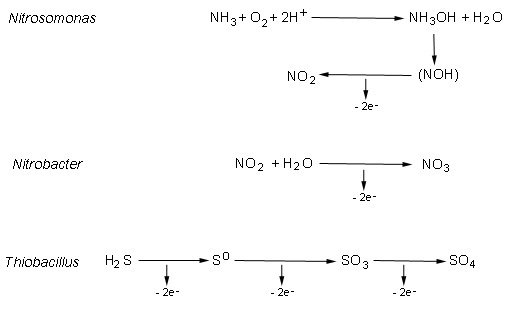 Nitrosomonas oxidizes ammonia to NO2 and Nitrobacter oxidizes NO2 to NO3. Most of the nitrifying bacteria are obligate lithoautotrophs, the exception being a few strains of Nitrobacter that will utilize acetate. CO2 fixation utilizes RUBP carboxylase and the Calvin Cycle. Nitrifying bacteria grow in environments rich in ammonia, where extensive protein decomposition is taking place. Nitrification in soil and aquatic habitats is an essential part of the nitrogen cycle. Lithotrophic sulfur oxidizers include both Bacteria (e.g. Thiobacillus) and Archaea (e.g. Sulfolobus). Sulfur oxidizers oxidize H2S (sulfide) or S (elemental sulfur) as a source of energy. Similarly, the purple and green sulfur bacteria oxidize H2S or S as an electron donor for photosynthesis, and use the electrons for CO2 fixation (the dark reaction of photosynthesis). Obligate autotrophy, which is nearly universal among the nitrifiers, is variable among the sulfur oxidizers. Lithoautotrophic sulfur oxidizers are found in environments rich in H2S, such as volcanic hot springs and fumaroles, and deep-sea thermal vents. Some are found as symbionts and endosymbionts of higher organisms. Since they can generate energy from an inorganic compound and fix CO2 as autotrophs, they may play a fundamental role in primary production in environments that lack sunlight. As a result of their lithotrophic oxidations, these organisms produce sulfuric acid (SO4), and therefore tend to acidify their own environments. Some of the sulfur oxidizers are acidophiles that will grow at a pH of 1 or less. Some are hyperthermophiles that grow at temperatures of 115 degrees C.
Iron bacteria oxidize Fe++ (ferrous iron) to Fe+++ (ferric iron). At least two bacteria probably oxidize Fe++ as a source of energy and/or electrons and are capable of lithoautotrophic growth: the stalked bacterium Gallionella, which forms flocculant rust-colored colonies attached to objects in nature, and Thiobacillus ferrooxidans, which is also a sulfur-oxidizing lithotroph. Figure 15. Lithotrophic oxidations of nitrifying bacteria and sufide oxidizing bacteria and archaea.